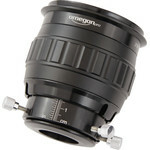 Are you looking for an inexpensive focuser that is as high-precision and backlash-free as a Crayford? That is exactly what the Omegon 2" Helical IF focuser provides. 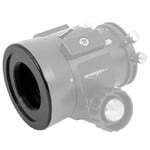 The high-precision mechanics ensure very sensitive and precise focusing. The inner focusing mechanism also means that this focuser does not rotate attached accessories, but raises and lowers them - just like an elevator. What makes a helical focuser a viable alternative? Unlike a Crayford focuser, the helical focuser design has a large focusing wheel. This means it is also very easy to operate in cold weather when wearing thick gloves. You don't have to fumble for it in the dark as it is easily found almost immediately. The design means a helical focuser is lighter compared to other focusers, and this can be crucial when you are trying to balance the telescope. This helical focuser lets you focus precisely. 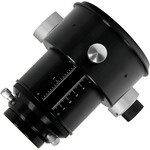 It also requires less maintenance than a Crayford focuser, since there are no ball bearings and no need to adjust it. 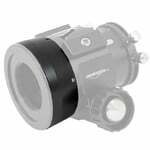 Many simple helical focusers have the disadvantage that they rotate during focusing, which means that your accessories also rotate. The Steeltrail helical focuser is designed completely differently: The inner 2" barrel moves in and out with millimetre precision and your camera or eyepiece will always remain exactly in position. 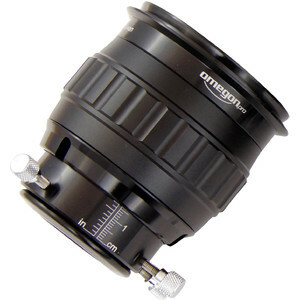 The helical focuser can carry a heavy eyepiece such as a huge 31mm Nagler, or a hefty camera with absolutely no problem. It can take virtually any accessory that you wish. This enormous load-bearing capacity is inherent in the design, meaning the focuser tube cannot slip. Attach a suitable adapter to the focuser via an 80mm dovetail ring. Many amateur astronomers have a Skywatcher telescope and want to upgrade it. Up to now they had a problem however: there was no suitable adapter available for Skywatcher dimensions. But now our optional Omegon adapter lets you attach your new focuser to your Skywatcher telescope in only a couple of minutes. When are you going to upgrade your telescope with a professional quality focuser? 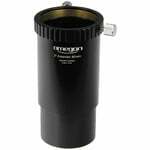 The focuser can take 2" or 1.25" eyepieces. 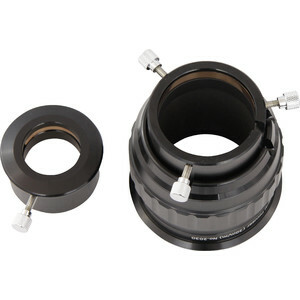 Both adapters make use of a compression ring, so your astronomical equipment is always optimally protected. 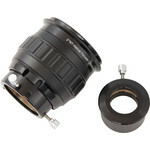 Turn the focuser wheel, and the inner tube moves outwards or inwards and focuses your object. A millimetre scale displays the precise focus position for you. 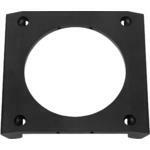 Three screws let you can clamp any 2" eyepiece evenly in place for a rock-solid seating.